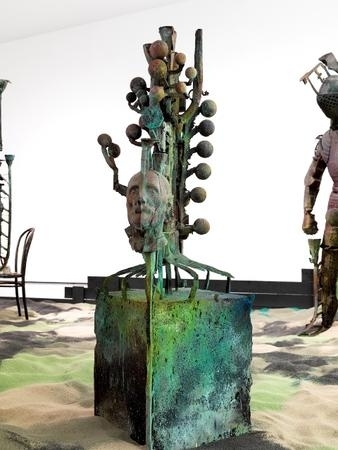 FOLKERT DE JONG From Stately Throne, 2014 Patinated bronze 82 5/8 x 35 3/8 x 33 7/16 in. 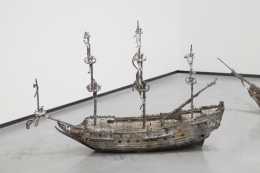 FOLKERT DE JONG The Trumps Major I, 2014 Patinated bronze 39 5/16 x 11 3/4 x 11 3/4 in. 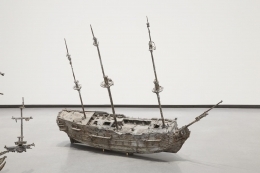 FOLKERT DE JONG Act of Supremacy, 2014 Patinated bronze 15 11/16 x 11 3/4 x 7 13/16 in. 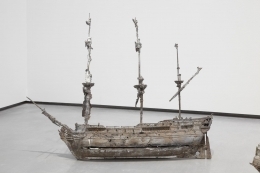 FOLKERT DE JONG The Mineral World I, 2014 Patinated bronze 35 3/8 x 12 9/16 x 7 13/16 in. James Cohan Gallery is pleased to announce The Holy Land, an exhibition of new works by Folkert de Jong, opening on March 19th and running through April 25th. A reception for the artist will be held on Thursday, March 19th from 6 – 8 PM. 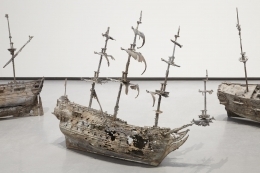 Folkert de Jong is internationally recognized for figurative sculptures—executed in the inorganic industrial materials of Styrofoam and polyurethane—that mine issues of empire, trauma and myth. 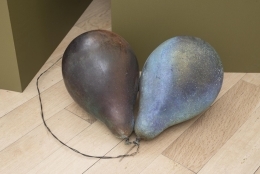 In 2012, De Jong made his first works in cast bronze, bringing experimentation and edge to the medium, as well as engaging in the history of the monument and public art. 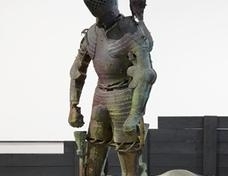 The works in The Holy Land were developed for De Jong’s recent solo exhibition at the Hepworth Wakefield in Yorkshire, UK, where, in collaboration with the Royal Armories in Leeds, the artist made 3D scans of suits of armor belonging to Henry VIII. The resulting bronze sculptural portraits depict a battle-ready ruler at three stages of his life, from the young peacock to the fat stoic. Old DNA, which grew out of the monarch’s final suit of armor, depicts a top-heavy cannonball of a man, with legs that hollow out from the back. An external nervous system or energy field running around the figure—derived from casting channels that would typically be clipped off the work before completion—is exposed, unprotected. 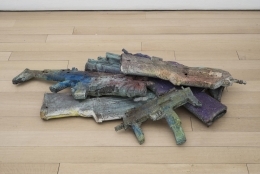 The bronzes are shown alongside casts of contemporary firearms from the Armories’ collection and a group of new mixed-media figures trapped inside multicolored Plexiglas vitrines. The Holy Land addresses the idea of preservation, in the sense of both immortalization and protection. How do we decide what to remember from history, and what do we leave out? How do facts erode, and how can we restore them? 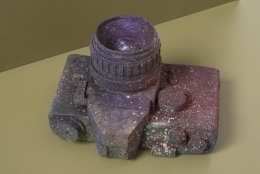 “The scene De Jong creates does not feel like an official history,” writes the Hepworth curator Sam Lackey, “but rather a hidden or unseen moment—an uncovered conspiracy from the past.” The Holy Land is frozen but alive, a series of monuments built from unexpected connections, with meaning gathering at the seams. De Jong has designed the costumes for CRY, TROJANS!, the Wooster Group and Royal Shakespeare Company’s touring co-production of Troilus and Cressida, which starts its second New York run at St. Ann’s Warehouse in Brooklyn in March 2015. Upcoming in April, De Jong will be included in the major exhibition Picasso in Contemporary Art at the Deichtorhallen, Hamburg. From May to August, the Kranenburgh Museum in Bergen will host a group exhibition curated by De Jong, Manifesten, including artists, designers and architects as varied as Walter van Beirendonck, the Wooster Group and RAAAF (Rietveld Architecture-Art-Affordances). 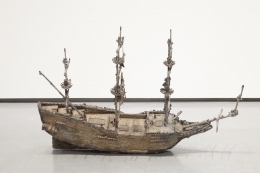 Folkert de Jong (born 1972, Egmond aan Zee) has been the subject of recent solo exhibitions at the Hepworth Wakefield, Yorkshire; MUDAM, Luxembourg; Musée d’Évreux, Normandy; Portland Art Museum, Oregon; Middelheim Museum, Antwerp; and the Musée d’art Contemporain, Rocheouart. Selected recent group exhibitions include Post-Picasso, Museu Picasso, Barcelona; Music Palace, Fondation Boghossian, Brussels; Dramedy, Fort Worth Contemporary Arts, Texas; The Anatomy Lesson, Gemeentemuseum, The Hague. 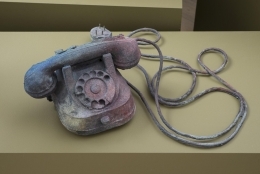 Selected collections include the GEM Art Museum, The Hague; the KRC Collection, Rotterdam; the Los Angeles County Museum of Art; The Lever House Art Collection; the Rabo Art Collection; and the Saatchi Collection. He was the recipient of the Prix de Rome in 2003. De Jong lives and works in Amsterdam. Production of this exhibition has been made possible in part by the generous financial support of the Mondriaan Fund.